The calendar is the cornerstone of the BabyCorner app. It gives a very clear picture of how your life looks like with your baby. The calendar shows all the activities you have chosen to be important. Activities are displayed as icons, and they are located on the calendar on the selected date and time. For every activity you can also attach a sound recording and a photo. New activities are added with a few taps on the screen, and in addition to the over 20 predefined activities with corresponding icons, you can add your own activities and icons. The BabyCorner App allows you to get a graphical overview of the various activities. How much time have you spent on breastfeeding or changing diapers in the past week? How many times have you been to the doctor with your baby in the past year? How many hours of sleep did your baby get yesterday? Etc., etc. It is completely up to you, what you want to view statistics for, and you can choose to display up to three different activities simultaneously in the same overview. Share your baby’s status with your friends on facebook. With the BabyCorner app you can quick and easy, without leaving the app, specify a status on your facebook page. 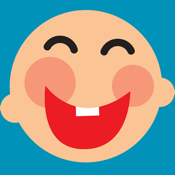 With a few clicks you can choose an icon which, for example, indicates that your baby is happy. And you also have the option to add an optional text. Quick and easy. Without leaving the app you can also quickly send an email.